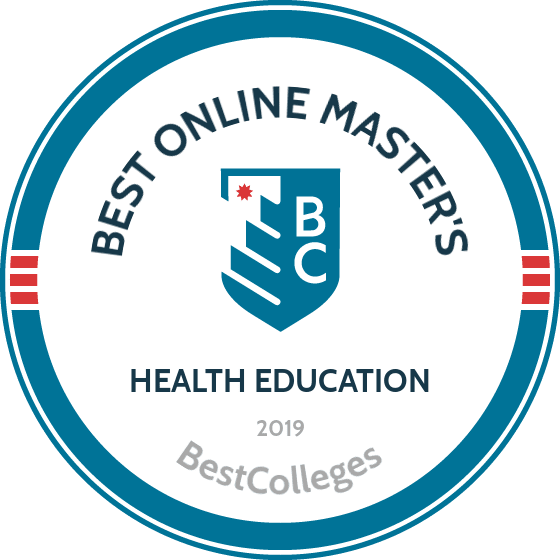 WHAT ARE THE BEST ONLINE MASTER'S IN HEALTH EDUCATION PROGRAMS? What Else Can I Expect From an Online Master's in Health Education Program? The health education field continues to grow at an above-average rate due to the need to educate people about healthier behaviors. Students prepare to teach in a variety of settings, and health education employment looks to grow 16% between 2016-2026. Many programs provide master's students with a chance to conduct their own research and fieldwork. An online master's in health education prepares you to positively impact the public by advocating for change and creating programs that promote better health. Admission requirements vary by program, but many of the best master's degrees in health education do not require previous work experience -- though many programs require students to submit a current resume. Students with significant work experience can, in some cases, waive a practicum or required aptitude test. Many programs differ in concentrations offered, number of credits required, and program length. Other factors to consider include whether a school offers its program entirely online and the cost of tuition. If a school does not offer its program completely online, then students need to complete certain parts on campus. Figuring out what learning formats work best for you makes choosing the right program easier. CAN I WORK WHILE I COMPLETE MY ONLINE MASTER'S IN HEALTH EDUCATION? Flexibility serves as a key component to many online master's in health education programs, and options for full-time or part-time study can prove beneficial for working professionals. Students can complete most programs entirely online or with minimal on-campus requirements. Instructors teach online classes in a synchronous or asynchronous format. Synchronous courses require students to participate in online courses at a specific time, while asynchronous courses allow students to complete assignments on their own schedules. WHAT ARE THE ADVANTAGES TO EARNING MY MASTER'S IN HEALTH EDUCATION ONLINE? There are many advantages to earning your degree online, including flexible course schedules, the ability to work from any location, and the ability to maintain current employment. If the program requires a practicum, you may qualify to complete it in your current city, which could lead to future employment. Some universities also offer lower tuition rates for online students. From its home base in Columbia, the University of South Carolina provides an innovative online master's in health education for individuals looking to learn more about promotion, education, and behavior. The degree, which can be completed in 24-26 months and comprises 45 credits, empowers individuals to become leaders in public health. All courses take place in eight-week formats to allow for quick degree completion. Coursework includes approaches and concepts for health administration, concepts and methods in health promotion, community health development, and examining health inequalities. Enrollees also complete a practicum seminar and practicum fieldwork, each of which lasts 14 weeks and requires learners to find an approved site within their region. Designed for working professionals, UofSC's online master's in health education program offers asynchronous coursework taught by industry-leading professors. Applicants must possess at least two years of full-time experience post-baccalaureate in a health professions-related field to qualify for admission. As a noted public research institution, UofSC is one of only 40 schools to receive the top-tier research and community engagement classification bestowed by the Carnegie Foundation for the Advancement of Teaching. The Council on Education for Public Health (CEPH) offers programmatic accreditation for the master's in health education degree, while the institution as a whole receives regional accreditation through the Southern Association of Colleges and Schools Commission on Colleges (SACSCOC). Students living outside South Carolina can expect to pay approximately $1,300 more in tuition than their in-state counterparts over the span of the program. Nebraska Methodist College of Nursing & Allied Health in Omaha offers a health education master's degree online for individuals who want to help others live their full potential. The M.S. in wellness and health promotion comprises 33 credits and takes 15 months to complete as a full-time student. As part of the experience, students hone their skills in areas of wellness marketing, exercise science, human resources, and general health professions. Each class lasts just five weeks and provides students a one-week break before the next course begins. Since all coursework takes place in an asynchronous format, learners do not need to worry about balancing professional and personal obligations alongside their education. Distance learners can expect to cover topics in theories and principles in health promotion, organizational diagnosis and needs assessment, ethical leadership and conflict management, and critical analysis of research. Rather than completing a practicum, individuals take part in two capstones that require them to submit a comprehensive portfolio that proves their understanding of overarching degree principles. For consideration, applicants must demonstrate a bachelor's GPA of 2.5 or higher, although it does not need to be in a health-related topic. Admission does not require GRE scores. NMC maintains accreditation through the Higher Learning Commission (HLC). All learners, regardless of where they live, pay a flat per-credit fee for online study. The institution also makes available financial support for distance learners. As the fourth largest higher education institution in North Carolina, East Carolina University in Greenville provides myriad degree paths based on student interests. Individuals looking to teach others about wellness can pursue the online master's in health education with a concentration in health education and promotion (MAEd). This program mandates that students successfully complete 36 credits of coursework. Topics covered in the two years of full-time enrollment include intervention strategies for health education and promotion, needs assessment in health education and promotion, introduction to epidemiology, and foundations of health education and promotion. Upon degree completion, distance learners can opt to either take part in a supervised internship at an approved site or write a unique, comprehensive thesis on a specific topic in the field. Individuals hoping to receive admission to this program must submit GRE or MAT scores, demonstrate an undergraduate GPA of 2.7 or higher, and complete the graduate application packet. Prospective students do not need to possess health-related work experience to receive consideration. Since ECU does not maintain authorization from all 50 states, learners outside North Carolina should ensure the institution has received authorization from their state before applying. ECU maintains accreditation through the Southern Association of Colleges and Schools Commission on Colleges (SACSCOC). Since 1888, New Mexico State University in Las Cruces has helped hundreds of thousands of students gain the education needed to find meaningful careers. As one of the state's two flagship institutions, NMSU serves approximately 15,000 learners through on-campus and online programs. NMSU's online master's of public health requires 42 credits for completion. Most distance learners finish the program in three to four years, depending on whether they study on a part- or full-time basis. Regardless of where they live, online degree seekers pay the same rate per credit. In addition, NMSU also provides a discounted price for active military members. Transfer students can apply up to nine credits from previous coursework at another institution. Core coursework for the online master's in health education includes community and psychosocial aspects of public health, epidemiological approaches to disease control and prevention, and techniques of health communication and education. Aside from general studies, learners can also decide to complete concentrations in health behavior and health promotion, or health management, policy, and administration. As they near the end of the program, distance students can select from both thesis and non-thesis options. Those who opt for the latter complete three more credits from available electives. Regardless of the path chosen, all degree seekers must participate in a field experience, ranging from one to four credits, to gain practical skills before graduating. NMSU receives accreditation through the Higher Learning Commission (HLC), while the MPH maintains approval from the Council on Public Health Education (CPHE). Concord University in Athens, West Virginia, maintains a small student body of less than 2,500 learners. Individuals seeking an intimate learning environment without a high price tag often feel drawn to CU. The school offers an online master's in health promotion comprising 33 credits and requiring approximately two years of full-time study. After completing CU's master's in health education and promotion, graduates qualify to sit for the Certified Health Education Specialist (CHES) exam. Coursework includes health interventions for school-aged children, research in the health sciences, health education program planning and evaluation, and epidemiology in health. Students can also complete an emphasis in social and behavioral health. During their final semester, distance learners take part in a six-hour health practicum to gain hands-on skills in the workplace. To qualify for admission, students must demonstrate a minimum 2.75 GPA from undergrad work and provide two letters of recommendation. Concord does not require GRE or MAT scores. Students do not need to visit campus, as all coursework takes place online. Designed to ensure busy professionals receive the support they need, professors present all courses in an asynchronous format. To excel in this program, Concord suggests that student should possess computer literacy and writing skills while also self-directing their learning and working with others in the process. Concord University maintains accreditation through the Higher Learning Commission (HLC). Most online master's in health education programs differ by concentrations offered and credits required. Some program also differ by the type of degree a graduate obtains, with options including a master of science, a master of public health, a master of education, and a master of arts in health education. Each option includes different goals and outcomes that change the focus of the program. Admission requirements for an online master's in health education vary by school, but you should expect to provide verification of holding your bachelor's degree and official transcripts from all colleges you previously attended. Every school decides what it considers the minimum GPA, but many aim to recruit students with at least a 3.0. In addition, secure letters of recommendation from both an academic and a professional reference, as your selected schools may require them in addition to the application. You may also need to write a personal statement that outlines your academic and professional goals. Furthermore, develop a resume that showcases your work experience and academic accomplishments. Some programs require at least two years of experience in a health-related profession and possibly a GRE score for admissions eligibility. Health Promotion/Community Health The health promotion concentration, often called community health, caters to students interested in designing and implementing health programs. The curriculum focuses on the causes that influence health behavior, research and evaluation, and leadership and advocacy. Typically, students need to meet the requirements to take the Certified Health Education Specialist Exam (CHES). This concentration proves essential to all health educators, especially those who want to manage programs and work with specific populations. Graduates may also work in consulting or become health education writers. Teacher Certification Teacher certification prepares students to educate in a school setting. The concentration usually includes teacher education and theory of learning courses. Online students should check carefully to ensure they will qualify for certification upon graduation. Possible careers include health education teachers in a K-12 setting and working in education-related environments, including district administration, colleges and universities, and nonprofits. Workplace Wellness Many organizations implement employee wellness programs in order to decrease healthcare costs and increase employee productivity. This concentration teaches students how to assess, develop, and evaluate programs in the workplace and focuses on developing health promotion activities that encourage exercise, smoking cessation, and weight loss. This growing sector of health education can lead to working as either a consultant for many different organizations or as a wellness specialist for a specific company or organization. Each online master's in health education includes different core and elective course requirements. However, many programs cover the same basic information regarding research methodology, program evaluation, and communication. The list below includes classes commonly found in online master's in health education curriculums. Research Methods and Design: Students learn research methods that can apply to individual and group health behavior. It involves analyzing different research designs and learning about instruments and statistics that learners and scholars use in research. This knowledge proves helpful as students progress into courses about evaluation and begin their practicums. Evaluation of Health Promotion Programs: Almost all health education programs include courses that teach students how to conduct health program evaluations. Students often need to plan and implement an evaluation.This fundamental skill serves as a core component of most health education jobs. Communication Strategies: Health communication messages and campaigns are important to health education careers, so learning communication strategies proves essential. Students apply communication theory to the development of messaging. Community Health Promotion: This course teaches the fundamentals of organizational development, policy, and evaluation in order to improve health on a community level. Students review the skills involved in planning, implementing, and evaluating community health promotion programs, implementing and evaluating their own models. It serves as an essential course for learners interested in working in wellness, health coaching, and community settings. Practicum: Often referred to as fieldwork, the practicum requirement usually involves a work or service project in an agency or institution. Students may need to plan and implement a research project or health promotion program while under the supervision of faculty. The course often culminates in a presentation or portfolio and, in some cases, leads to full-time employment for the student. HOW LONG DOES IT TAKE TO GET AN ONLINE MASTER'S IN HEALTH EDUCATION? Students can usually complete a master's in health education in 1.5-3 years, depending on whether a student attends part time or full time. Most degrees require around 36 credits, but some require up to 45. Several characteristics that affect the length of an online master's degree, including the number of credits required to graduate, course availability, and course load. Field experiences and teaching certifications require students to complete learning outside the classroom. Some programs may allow students to take any number of credits per term or set their individual pace, while other programs work on a cohort model. Cohorts require students to move through the program at the same pace as their peers, providing a more traditional setting. The knowledge and skills you gain and strengthen when earning a health education master's degree online depend on where you enroll in school. Nevertheless, most graduates demonstrate core proficiencies that allow them to make a smooth transition into the career of their choice thanks to what they learn through their studies. Leadership: Leadership skills enable you to advocate for necessary change in organizations and policies to ensure people's health and well being. Leadership skills also allow you to make a difference by promoting best practices in the field. Program Design: This skill prepares you to develop programs that promote good health for individuals and organizations, including through public policy. You can innovate activities and identify those who can implement them. Research: You know what variables to examine to determine the efficacy of health programs. This allows you to determine if and how well they meet their intended objectives to the benefit of society. Communication: You can thoughtfully articulate research findings and best practices verbally and in writing to reach diverse audiences. You can help non-experts more easily understand complex health-related concepts. Critical Thinking: You can analyze what does and does not work in promoting and ensuring good health and make recommendations for improvement. You can collect and assess evidence to make data-driven decisions. An online health education master's degree requires more than attending classes and completing course assignments. Some programs mandate either an internship or practicum that provides real-world, hands-on experience in the field. This kind of learning opportunity allows students to practically apply their textbook studies in settings and situations that working professionals face. Earning your degree might also require a capstone project, which could involve research to examine a specific topic in depth. In addition, programs for an online master's in health education frequently require students to write a thesis to verify the knowledge they gained during their studies. Certified Health Education Specialist: The CHES exam is offered by the National Commision for Health Education Credentialing, Inc. and proves a professional's competency. The exam includes 165 questions that test knowledge in seven areas of responsibility. Many master's programs in health education meet the requirements to take the exam. Master Certified Health Education Specialist: The MCHES caters to advanced-level practitioners and tests entry- and advanced-level competencies. Practitioners need to meet academic qualifications, need five years of work experience, and must satisfy continuing education requirements. Practitioners who have been CHES-certified for less than five years can still take the MCHES if they hold a master's degree and five years of work experience. Prospective students should look for a college or university that holds accreditation, as accreditation indicates that a school has been evaluated by an outside agency and passed certain benchmarks. Regional accreditation is considered the highest form of accreditation, and only seven regional accrediting agencies enjoy recognition from the Department of Education (ED). National accreditation is generally for more career-oriented or vocational colleges. Credits from regionally accredited colleges transfer more easily than from nationally accredited colleges, and graduate programs often look for students to hold an undergraduate degree from a regionally accredited college. Schools and programs come with programmatic accreditations as well. Online master's in health education degrees may hold accreditation from the Council on Education for Public Health (CEPH), but most importantly, students should look for programs that prepare them to take the CHES exam. Accrediting agencies receive oversight from either the ED or the Council for Higher Education Accreditation (CHEA). Without accreditation from an ED-approved agency, a college cannot offer federal aid to students and credits may not transfer to other universities. Many accrediting agencies also apply for CHEA evaluation because of its high standing in the accreditation world. The ED and CHEA recognize regional, national, and programmatic accreditors. Prospective students can find a list of accredited schools on the ED website. Some health educator positions require a master's degree, particularly in the areas of community health education, school health education, and health promotion. According to Salary.com, health education workers with advanced degrees earn more than their counterparts with bachelor's or associate degrees. In addition to degree level, the type of employer impacts the salaries of health educators. Health educators can work in many settings, but median annual salaries can vary by over $20,000 per year. The following table includes data from the Bureau of Labor Statistics (BLS) on the median salaries of health educators based on their employment industry. Students who earn one of the best master's degrees in health education qualify for a number of career paths. With learned skills in the areas of communication, leadership, evaluation, and research, graduates are prepared for future roles in health education that can include management, teaching, and program coordination. The list below includes some common career paths. Health Educator and Community Health Worker: Health educators teach people how to improve their behaviors to promote wellness. They develop strategies, collect data, and evaluate health promotion programs. Individuals may perform this job in a variety of settings, including in hospitals, nonprofit organizations, government, and private businesses. Medical and Health Services Managers: Also called healthcare administrators, health services managers plan and coordinate health services. Individuals can perform this job in a facility, department, or group medical practice. Health Specialties Teacher: This job can involve creating programs and materials at the collegiate or university level on topics that affect young adults, such as nutrition and alcohol consumption. They may also advocate for campus policies that promote health. Dieticians and Nutritionists: These professionals promote health and manage disease through the use of food and nutrition. Job settings include hospitals, nursing homes, and clinics. Social and Community Service Managers: Social and community service managers coordinate social service programs. They for work at nonprofits, for-profit social service companies, and government agencies. Many employers prefer that managers hold a master's degree. Joining a professional organization can be a great asset to a student or recent graduate of a health education program. Professional organizations provide networking opportunities where learners can meet like-minded professionals and encounter future job opportunities. National organizations often boast state and regional chapters that work on health education in the local community. Some organizations also work to influence federal health education policy and share public health research. The list below includes organizations that can benefit your health education career. American Public Health Association: APHA promotes the health of all people and communities, works to influence federal policy, and shares public health research at their annual meeting. They also lead public awareness campaigns. Society for Public Health Education: SOPHE raises awareness of the connections among health education subjects, builds the skills of health educators, and increases the ability for local chapters to work with communities to reduce health disparities. National Commission for Health Education Credentialing: While technically not a professional organization, the NCHEC manages CHES and MCHES certification, working to maintaining the highest level of competency among health educators. They also work to promote the value of certification. All students applying to graduate programs should complete the Free Application for Federal Student Aid (FAFSA). This allows financial aid offices to see what types of aid you qualify for, and some colleges also require FAFSA results for scholarship and grant eligibility. Specific scholarships go to students in the field of health education, such as fellowships from the Association of Schools and Programs of Public Health and the Centers for Disease Control. Approximately 66% of today's college students rely on loans to fund their education, but there are plenty of overlooked financing options you can use to reduce your overall student debt. Completing the FAFSA serves as a crucial first step for any student with financial needs. Our FAFSA guide features a step-by-step rundown on the process and answers to several frequently asked questions. Learn about the different funding opportunities available to online students by clicking on this link. Online programs can provide an affordable and flexible option for women trying to balance the demands of work, family, and earning their degrees. This list provides access to valuable scholarships specifically for women. Online college programs serve as a flexible, affordable option for single parents interested in earning a degree and securing their family's financial future. The list on this link provides access to scholarships, grants, and other financial aid options geared toward single parents.